It’s not the worst bedroom I’ve had the pleasure of living in. No – that place in my heart is reserved for Reigo Street, student halls. Don’t get me wrong, halls was fantastic fun, but the bedrooms, Christ they were depressing, little dungeons in cased in sombre grey brick. Even attempts to add some cheer – a poster or ten, gets you slapped with a £50 fine. Which quite frankly, takes the utter piss. No, this bedroom is far superior. The walls are a patchwork of pictures, posters and random memories, my favourite being a page from an old primary school jotter. The top half is a typical child’s drawing of a person, an unconvincing creation of wobbly triangles with a smile that breaks the boundaries of its head. Ever so slightly manic. 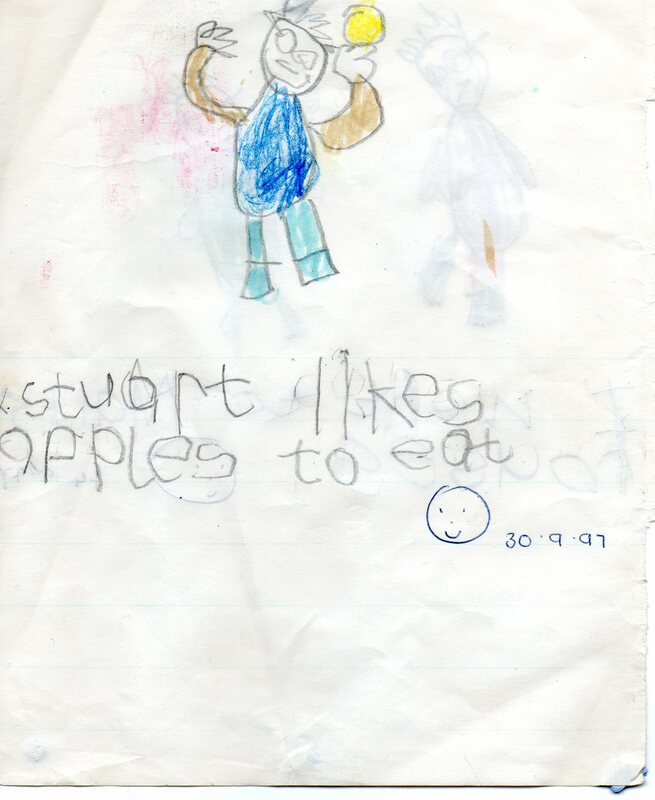 The story below simply reads “Stuart likes apples to eat”. Breaking news for a five year old.